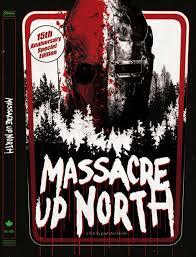 Massacre Up North is a little SOV film from 2001 that has developed a bit of a cult following over the years. Shivers Entertainment recently picked this little treasure up and have released it finally on DVD for the 15th anniversary. It’s the story of Leslie and Patrick. When they were kids camping Leslie was playing in a tent while his dad was making Kabobs. When the flame gets to high he flings back sending one of the kabab’s flying into the tent Leslie is in. He doesn’t really do anything, neither does his wife. They basically and unemotionally watch it burn. We see that Leslie has suffered 3rd degree burns on his face leaving him slightly deformed. He has to wear a mask to school, and as kids are cruel they torment him. Finally he just snaps. He kills his mom and dad, a group of kids in a hotel after prom, he even burns down an entire frat house full of people having a party. We flash forward to the present and see Leslie running his uncles hardware store and living in his parent’s old house. His brother is now the county coroner and Leslie has just received ownership of the hardware store as his uncle is retiring. So when your insane and have a hardware store what do you do? You go on a killing spree of course. And as I mentioned, his brother is the coroner so guess who gets assigned to help catch the killer. Don’t worry his brother has no clue i's Leslie. This film is a great watch. It took me back to the days of when I would go to the local Blockbuster and find those straight to video films they only got 1 or 2 copies of. I haven’t watched an SOV filmed in this style in quite a while so it was a great time. Tons of gore for the horror fans out there and the scenes where Leslie is a kid do make him a slightly sympathetic character.